May has got to be one of my favourite times of the year- it’s my birthday on the 23rd, there are two bank holiday weekends and the brighter weather means it’s time for the summer wardrobe to make an appearance. Whether you’re lucky enough to be jetting somewhere lavish, or looking forward to a little cosy weekend break, there’s no reason not to dress for the occasion when it looks this good. Now that we’re hoping the sun is officially here to stay, it’s time to pick out some clothes that will take you from coastal mini break, to your next door neighbour’s BBQ to catching some rays at a poolside party. I’m such a shopaholic that this weekend and last weekend i’ve been on birthday-dress hunt shopping sprees and had three online order deliveries. Bearing in mind i’ve been searching for a birthday dress, I’ve managed to buy a hell of a lot of other items… whoops! But who cares May is always the month I like to treat myself and why shouldn’t you make the effort when the sun is out? You can never go wrong with an LBD, especially as an outfit for a night of your birthday celebrations. I really love a thin-strapped neckline and this bodycon dress was such a bargain at just £15 from Missguided. I find it hard not to go shopping without checking that most of the stuff I buy I’ll be able to wear both at work and on off-duty days. That’s why I love this dress- It’s perfect for your workwear and weekend wardrobe. It is also a massive saving- reduced from £17.99 to £7.99 in the New Look sale– this grey ribbed dress will take your from AM at the office to PM in the bar. As you can see I am loving New Look atm- they don’t just have some great new season stuff but they also have such great offers in the sale too! But I’m also loving the bright colours too- namely coral! 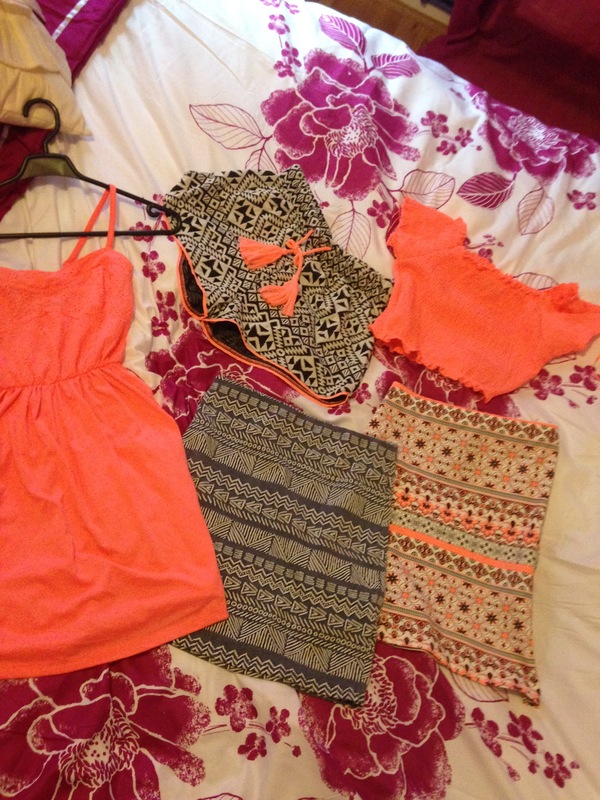 This was my Primark/New Look shopping- and yeah I did get a little bit carried away with the coral! My absolute favourite item i’ve bought this month though has got to be my new wedges from Primark at just £14. They are just so comfy and go with everything. I’m really fussy with shoes but when I tried these on I just had to have them! They my new essential item for the summer because they can take me from AM to PM and even fit in with my work wear attire. Skinny jeans and a smart fitted blouse for work- I love this £10 crop jumper/shirt combo from Primark because it brings some sophistication and style to the office. Wack on the new shoes and you will look like you mean business. A bold patterned crop top (£7.99 from New Look) and a white bodycon midi skirt to bring a mix of festival vibes and classy chic to a night out. High-waisted skinny jeans and a bardot gypsie top to rock the bohemian Summer trend. I absolutely love white nails in the summer and since it’s been so sunny lately I felt it was time wack the classic shade out. 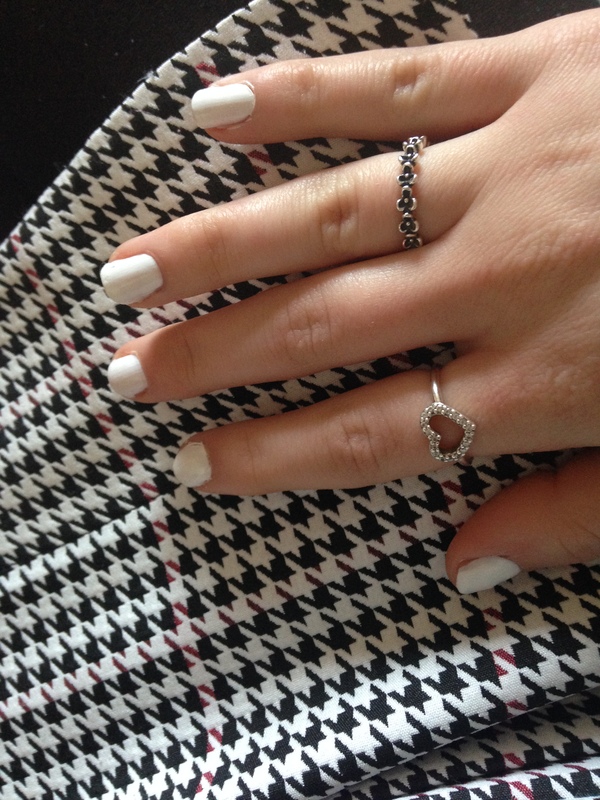 White nail varnish looks so fab against tanned skin and is great for getting heads turning with the bold statement look. Plus white goes with anything so you don’t have to worry about changing your nail colour to suit bright patterns or fancy prints of your outfit- giving you the perfect everyday summer nail shade. I loved the bold classic shade against my monochrome skirt to create a smart and sophisticated workwear look. 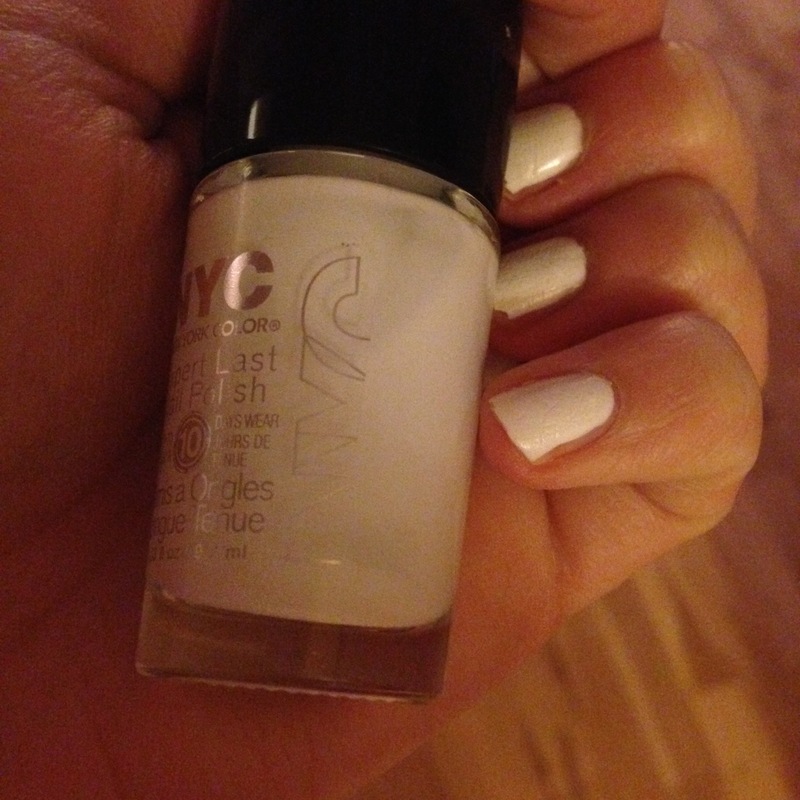 I used the NYC Expert Last Nail Polish for my manicure and it’s really great value! It was under £2 in Superdrug and can easily last up to week with no chips! I can’t stand when one of my nail’s paint starts to chip off or peel… not a great look! So this bottle is definitely a favourite of mine. I found this picture on Instagram and absolutely loved this statement manicure! If you want to go bolder and really get eyes turning pair the white with some glitter for special occasions and nights out! 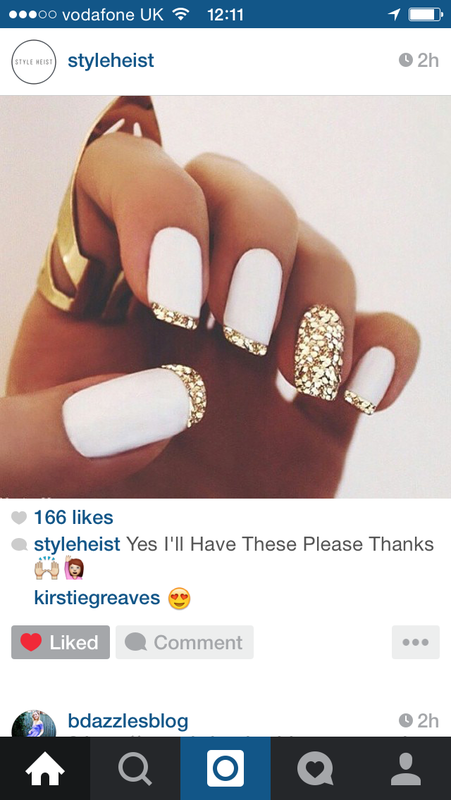 The next time I paint my nails white I am definitely going to try this look… you can never have enough sparkle!